BEIJING (Reuters) - Volkswagen's (VOWG_p.DE) top brand executive is confident that management and labor will solve a dispute over cost-cutting at the core autos division and signaled readiness on Sunday to meet some of workers' demands. 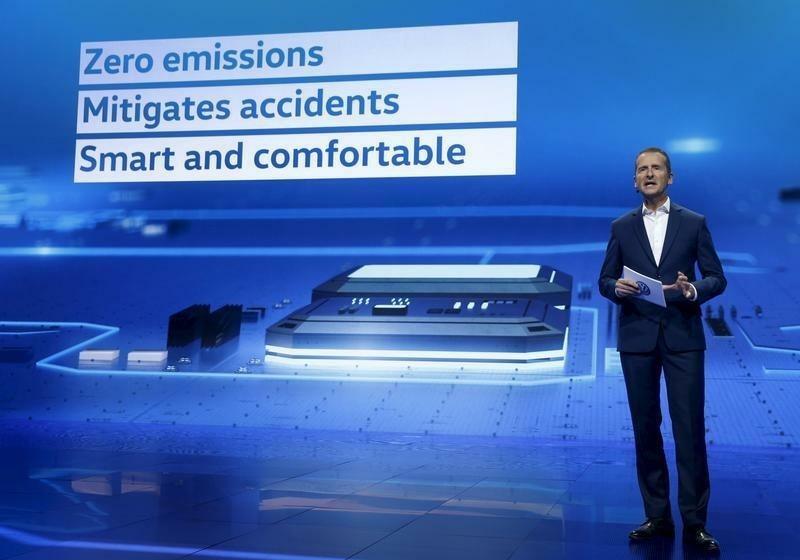 Volkswagen's (VW) powerful labor leaders earlier this month accused brand chief executive Herbert Diess of betraying workers and trying to use the diesel emissions scandal as a pretext for job cuts. Management and labor leaders have since pledged to jointly map out a strategy and agree "mandatory packages" to secure the plants in high-cost Germany, but details have yet to be worked out. "VW is changing rapidly, very much for the better in my opinion, and I am very confident that we will together get this done," Diess told reporters on Sunday ahead of the Beijing auto show which starts on Monday. Asked on Sunday whether he needs to do more to tie the unions into his plans, Diess replied: "We are already doing a lot. But of course we can do even more." "We are faced with a high need for change," said Diess. "At one place or another, that is causing a high (level of) edginess among workers and burdens the workforce." Osterloh, who leads the nine labor representatives on VW's 20-strong supervisory board, has repeatedly clashed with Diess over how to achieve greater cost savings ever since the former BMW (BMWG.DE) executive took office last July. The dispute has stoked speculation in the media that the 57-year-old Diess might quit VW. Asked whether he was planning to leave the Wolfsburg-based group, Diess replied: "No." Separately, Chief Executive Matthias Mueller said VW was bracing for another tough year as it expects only "little tailwind" from world auto markets. "2015 was a tough year for VW. And 2016 will be no less severe, because we have to handle the crisis and its consequences," the CEO wrote in a letter to staff published on Sunday.